I have joined the INDIA TODAY Group's movement to Declare War on Terror. Post-Mumbai, the cracks in our security structure stand seriously exposed. A complete revamp of the police force, especially at the metro level, is now top priority. 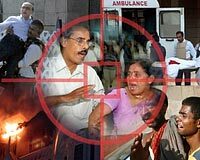 The National Police Mission, announced by the Prime Minister in October 2005 to empower and equip the police to effectively take up the challenges thrown by terrorism, remains in deep freeze. I humbly request you to implement police reforms proposed by the Mission on an urgent basis. As a beginning, you could get the states to upgrade the existing police stations and provide better equipment. The nation needs an alert and responsive police to fight the war on terror. We are banking on you to deliver. You can copy this letter and paste it elsewhere to take a print on your letterhead. Or, you can directly hit the 'print' button below.